This pumpkin cauliflower oatmeal recipe is simple and perfect for a warm and spicy fall breakfast. 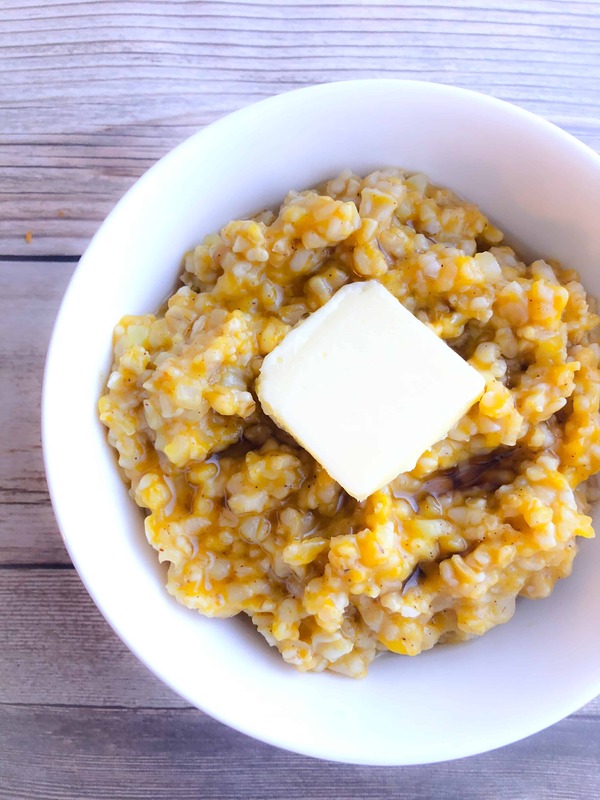 Eating this delicious and healthy pumpkin cauliflower oatmeal for breakfast is a great way to get your whole grains and veggies in at the start of your day! Seriously, when have veggies for breakfast been a better idea? Oatmeal is an old school traditional for many families, including mine. My grandmother considered oatmeal to be the gold standard for a hearty and wholesome breakfast. I remember sitting at her kitchen table time after time and her serving me a warm bowl of oatmeal with butter, sugar and milk and I couldn’t have been happier! Now I serve my son a bowl of oatmeal every morning and (thank God) he hasn’t grown tired of it yet. Recently as I lean into eating more low-carb meals and wanting to get my kid to eat more vegetables I thought that cutting his oatmeal with cauliflower was the right thing to do! I figured that with its mild taste and similar color he’ll never notice and I was right! Adding pumpkin and spices to the mix makes the dish extra tasty and oh so fitting for the fall season. Although this recipe was made with organic quick cooking steel cut oats, it can be prepared with standard rolled oats as well. Fresh and frozen riced cauliflower is readily available in many popular grocery stores including Costco, Trader Joes and Whole Foods. Riced cauliflower is simple to make by tossing cut up cauliflower into a food processor and pulsing until the cauliflower pieces appear to be the size of rice. This dish freezes exceptionally well and bulk batches can be made and frozen in your desired portion sized containers. Pour 2 cups of water and 1/4 of salt into a medium sized saucepan and bring to a boil. Add 1 cup of oats and cinnamon and cook under medium-low heat stirring occasionally for 4 minutes. Add pumpkin puree and cauliflower and continue cooking for 4-5 minutes until cauliflower appears translucent and is similar in color and texture to the oats. Remove from heat, serve immediately with toppings of your choice. If using steel cut oats which take approx 30 minutes in total to cook add cauliflower in 5 minutes prior to the oatmeal being done and proceed to rest of the recipe. Wow! This looks like regular oatmeal! This is going to help me step out my comfort zone! Thank you for sharing! I’ve never tried making oatmeal with cauliflower! But this sounds like it would taste really good! It does! I hope you try in and enjoy! Oh, wow. I never thought about subbing oatmeal with cauliflower! Right? Gotta sneak the veggies in! Wow, this looks delicious! I hadn’t thought to try cauliflower in oatmeal. Thanks, I’m adding it to the repertoire.